Sailing marks, tape and adhesive letters are often difficult to remove. There are still pieces left on many sails. Even when the entire sticker is removed, sticky residue often remains. This cannot be removed with normal cleaning agents. Other agents are often too aggressive and therefore damage your sail. Ultramar Sail Number Remover offers the solution! 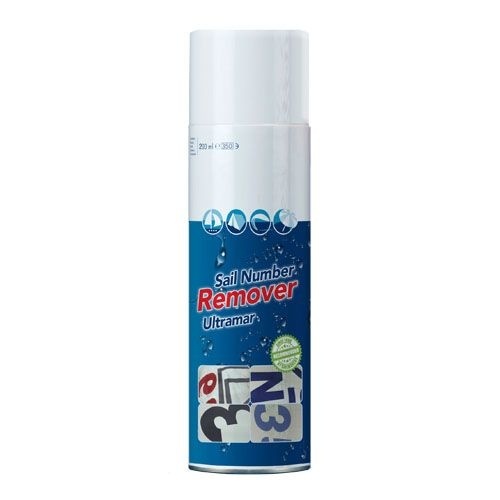 With this product, you can easily remove all sticker and adhesive residues. Remove sticky letters from the sailcloth. If necessary, first spray with Sail Number Remover and allow it to work for ten minutes. Spray glue residue and brush in. Leave Sail Number Remover to soak in for 15 minutes. Remove adhesive residues with water and a brush, sponge or cloth. If necessary, repeat several times until all adhesive residues have disappeared. Thoroughly clean the cloth with water. Allow the canvas to dry before you apply new numbers. Do not inhale the spray mist. Use only in well-ventilated places. Read the instructions on the package before use. Request the FREE MANUAL with the simple step-by-step plan! Would you like to know more about maintaining your tent, sail or boat cover? Then read our free manual with our Simple 3-Step Plan. Order before 15.00 = send the same day. Sail Number Remover removes sticker and adhesive residue from all textiles. Quickly and safely. Spray on glue. Wait 5 minutes. Remove glue with cloth and water. It couldn't be simpler!